Half way through your travels but finished your book? Got your pint in hand, got your seat by the fire in the Boots Bar, but forgotten to bring a good read to while away those long winter evenings? Clachaig’s Book Corner is here to help! 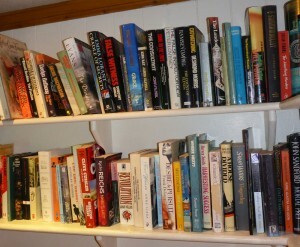 The Book Corner offers a wide variety of pre-loved books for sale. Our hope is that you’ll find another book to enjoy and also donate a couple of pounds for the Glencoe Mountain Rescue at the same time. Think that’s what you call a win-win situation. Have you got any books that you’re finished with? Drop them off and we’ll be glad to add them to collection and you can help us to keep more readers reading and raise a few more pounds for the local volunteer team. Whether donating, exchanging or buying, pop around to Reception, and we’ll introduce you to the Book Corner. The inn offers a variety of room types, with single, twin, double and family rooms to accommodate 3 or 4 all available. All rooms have tea and coffee making facilities, flat screen TVs, and en suite shower (some with bath and shower) facilities. The inn has been awarded ‘3 Star Inn‘ status by Visit Scotland. Clachaig Holidays also offers a variety of 4 star self catering accommodation, located at Clachaig Inn, as well as at stunning locations in and around the villages of Glencoe and Ballachulish. The Clachaig Holidays web site contains more information as well as real time availability..